By taking architectural floorplans from the first, published encyclopaedia as a source for seven large scale works made of graphite and acrylic, Guillermo Kuitca sets up an enquiry into the processes and history of organizing knowledge. Encyclopaedias exhibit the best impulses of human curiosity but also carry inherent doubt and contingency . Kuitca’s large and impressive canvases appear to scatter original drawings of neo-classical buildings into intricate fragments as if we are observing a puzzle being re-assembled on a floor. 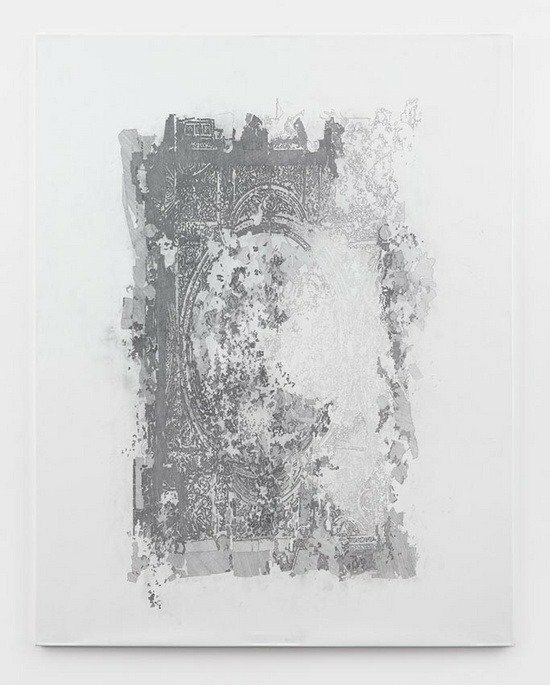 While aspects of ‘Encylopedie VII’ remains coherent and identifiably reproduced from an original, printed plate, other areas of the image appear to be in a state of chaotic collapse. ‘Untitled’, 2010 is a work almost measuring 2 by 4 metres and occupies a room to itself, but unlike the other pieces in the series, this image is taken to the edge of legibility. Details are so atomised that the original source becomes elusive. There is a familiar, contemporary technique here of digital imaging because these fragments are so confidently severed from each other as if Kuitca had applied ‘desktop’ strategies to manipulate copies. These enlarged and altered architectural plates, retrieved from history, extend Kuitca’s ongoing interest in epistemology, which he locates within the impulse to collate comprehensive information together . In an adjoining gallery, the artist was exhibiting untitled paintings that extend the same theme within a contrasting formal style. These canvases mimic the painterly, analytic brushwork of cubist painting and yet originate in unidentified maps. Like the scattered architectural plates, these paintings reconfigure pictorial facts. However, these abstract paintings almost lose any power of communication except for lines of paint in red and yellow that may suggest roads or landmarks on a map. The viewer is left with a series of painterly marks that conflate analytic description with instinctual expression. Our bearings are lost as we are left with implied information within images seemingly driven by subjectivity. Kuitca’s works inspired by the invention of the enclycopaedia brilliantly opens up a post-modern dialogue around meaning and authority, but the reconfigured maps are overly conceptual and are left adrift in a deep gap between invention and quotation so that they feel contrived and inert.